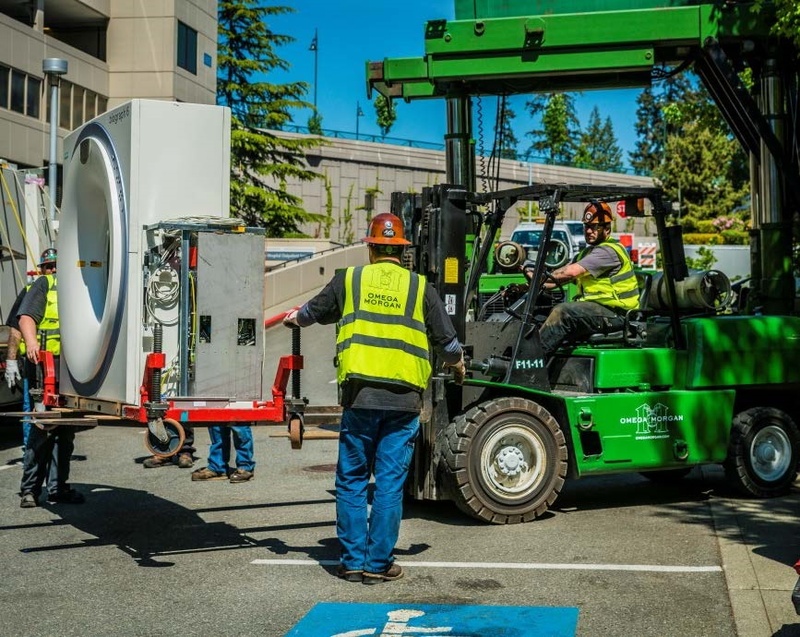 Our team’s experience and ingenuity was called on to develop a strategic plan to complete a medical equipment moving project at the Overlake Medical Center in Bellevue, WA. 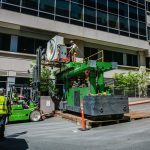 The medical imaging project presented unique challenges that required specialized rigging and machinery moving services to remove three massive MRI machines and two large CT scanners from the Medical Center’s second floor. 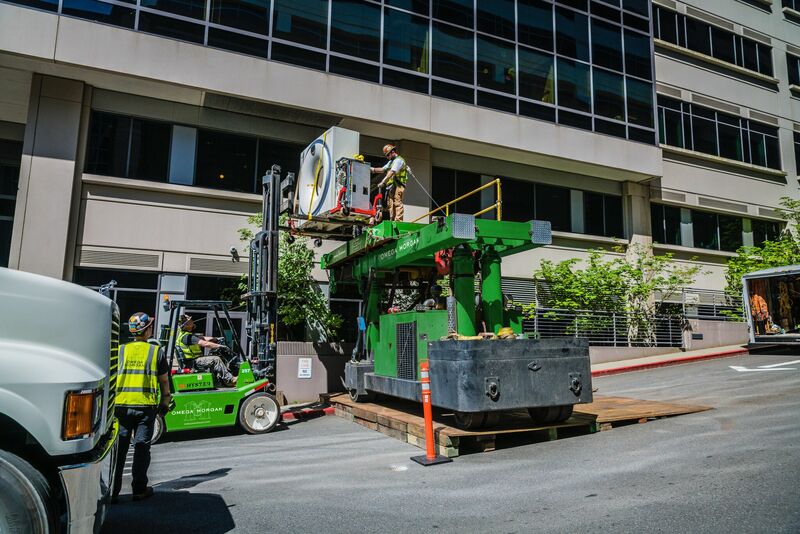 The equipment was then prepared for shipment or relocated and installed in the Center’s Medical Imaging Department on the building’s first floor. We also installed a newly purchased MRI machine on the first floor. Strategic planning to complete the project within the required time frame. The need to develop specialized rigging strategies using equipment that could lift massively sized, extremely heavy – but also extremely delicate – loads. 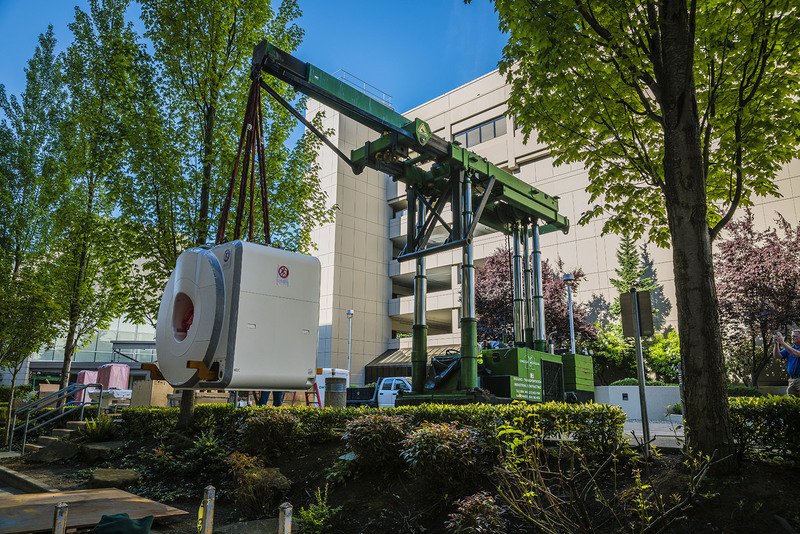 On average, a single MRI machine weighs 35,000 pounds, but can weigh as much as 90,000 pounds. Yet, for their size, they are exceptionally delicate and contain many fragile internal parts. CT scanners weigh less, but they are just as delicate. We needed to develop a specialized rigging plan to evenly distribute weight loads even though pick point selection was restricted to very few options. The need for special equipment and superior project planning skills to maneuver oversized loads in confined areas. The MRI machines and CT scanners were originally located inside small rooms with very little space to move around. Machines that weren’t shipped out were transported to and installed in equally small areas where movement was severely restricted. At an average cost of $1 million each, excessive bumping and jarring or dropping an MRI machine could cause catastrophic damage. The need to complete the project quickly to avoid interrupting patient care. 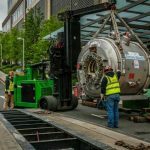 Of course, with the hospital’s MRI machines and CT scanners on the move, patients were unable to receive necessary medical care. Because we were in a hospital moving equipment that had to be shut down until it was reinstalled, time was of the essence. Our team tapped into a deep well of experience and specialized knowledge to formulate creative solutions to meet each of the challenges above. 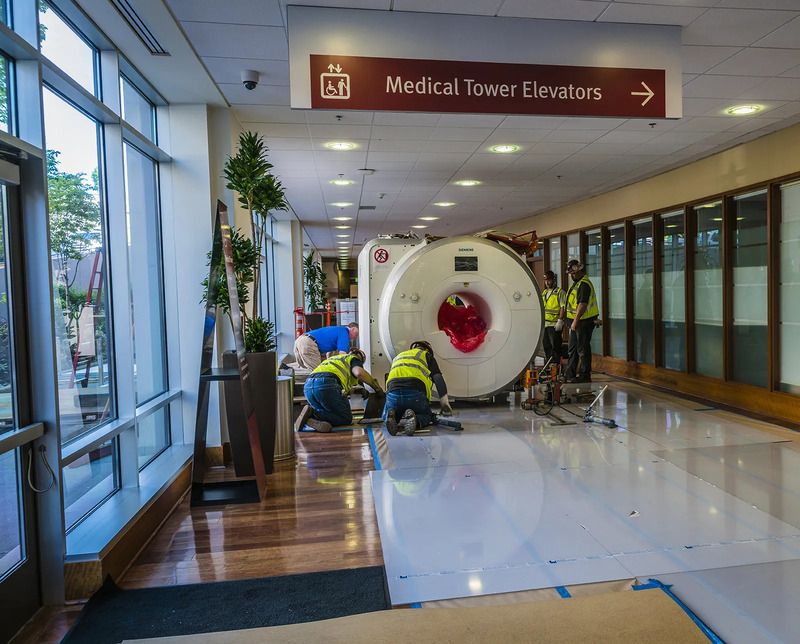 Our engineers carefully analyzed the heavy lift and rigging requirements to determine which pieces of lifting and moving equipment could safely lift and maneuver the MRIs and scanners in and out of tight spaces. The answer was two TriLifters and a Versa-Lift. These are two of our most versatile, largest capacity lifters. TriLifters can fit under a 10-foot doorway while lifting up to 75 tons. A Versa-Lift 40/60 can lift up to 30 tons with its base extended. Both are recognized for their exceptional ability to maneuver heavy loads in confined spaces. Using two TriLifters and one Versa-Lift 40/60, we were able to lift, transport, and install the MRIs and CT scanners safely, with ease, and without damage to delicate equipment. The medical equipment moving project’s size required more team members than are typically required to execute the customized strategies. 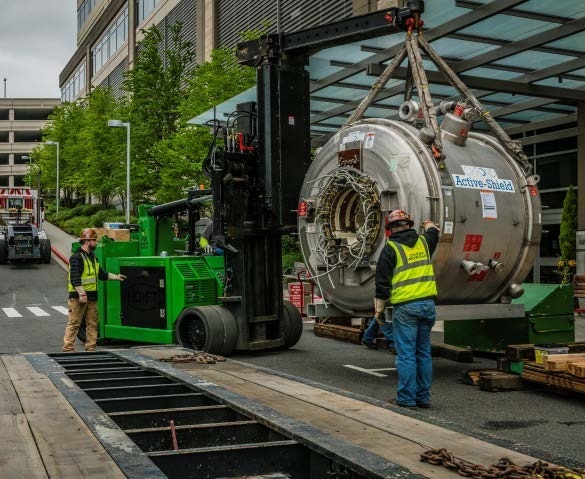 Whereas many projects require three to five movers to complete, Omega Morgan dispatched a twelve-person crew to guarantee the safe and successful completion of the Overlake Medical Equipment Moving Project. To cover all the bases, we also protected the hospital’s floors from costly damage with 400 feet of floor covering. 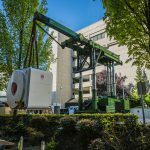 After removal, the MRI machines and CT scanners were either prepared for shipment or relocated to the new Medical Imaging Department on the hospital’s first floor. We also received one new MRI while onsite, which we then installed in the new Medical Imaging Department. The project’s many moving pieces required a great deal of planning and execution. When it was all said and done, we successfully completed the project within the necessary time frame. 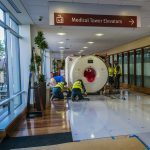 Patients were able to quickly return to receiving necessary medical imaging services at Overlake Hospital Medical Imaging Center. 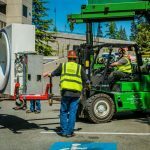 The teamwork and collaboration that was demonstrated throughout the entirety of this project showed our customer what Bleeding Green means.